When it comes to health, there’s a lot of talk about lowering your body fat percentage and “getting in shape.” But those people with joint pain know that health goes far beyond an outward appearance. How can you gain control of your body and strengthen your bones and joints? It all starts with a healthy diet. Check out these foods that can help. You already know that calcium contributes to strong, healthy bones, but what you may not know is that Vitamin D helps you absorb that calcium. This nutrient also helps reduce inflammation, but as the Beth Israel Deaconess Medical Center tells us, about 75 percent of Americans have a Vitamin D deficiency. While your body makes Vitamin D when exposed to sunlight—a good 15 minutes of exposure 3 times per week is often enough—some people can’t get their Vitamin D through this method. Fatty fish is an alternative to help you get your Vitamin D levels up and increase how much calcium your bones absorb. Fish such as trout and salmon can provide 97 percent or more of your daily Vitamin D recommendations in just a 3 oz. serving. However, it’s best to talk to your doctor to see if you are in fact Vitamin D deficient. You know you need calcium for strong bone growth, and milk tends to be the food product with the best reputation for it, but dark leafy greens are packed with calcium, too. That’s not to mention that there are tons of other excellent nutrients in them like Vitamin A, C, and K. These vitamins also contribute to healthy joints through antioxidative powers that help combat the damaging effects free radicals have on your joints. Plus, bones require a variety of nutrients for growth, including Vitamin C and K alongside calcium. It’s a no-brainer that raw fruit is great for you, but you may not know that fruit contributes to healthy bones and joints. 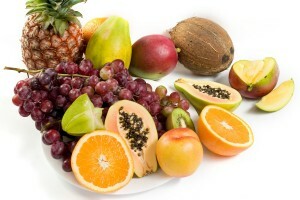 Many fruits are high in Vitamin C, a nutrient that your body uses to build strong bones. This is because Vitamin C helps promote the production of bone-building cells (called osteoblasts) and inhibits the production of bone-destroying cells (called osteoclasts). In fact, higher levels of Vitamin C have been shown to promote higher bone mass and lower fracture rates. It’s best to limit saturated fat in your diet and aim for more unsaturated fats. High levels of saturated fats can increase homocysteine levels, which is a chemical that decreases bone mass. But there’s no need to worry too much. The foods mentioned are already low in saturated fats, so eating more of these foods will naturally reduce your saturated fat intake. If you’re already eating a healthy diet, there shouldn’t be much to tweak to maintain strong, healthy bones and joints. However, it’s best to consult your doctor about persistent pain that a tweak in diet can’t fix. Now that you’re equipped with this knowledge about what to eat for healthy bones and joints, how will it change your eating habits? This entry was posted in Informational, News and tagged Health, nutrition. Bookmark the permalink.